Download Catalog #38 PDF: Click to download (requires Adobe Acrobat Reader). Printable in B&W or color! Last featured in March 2004 (Catalog # 30). 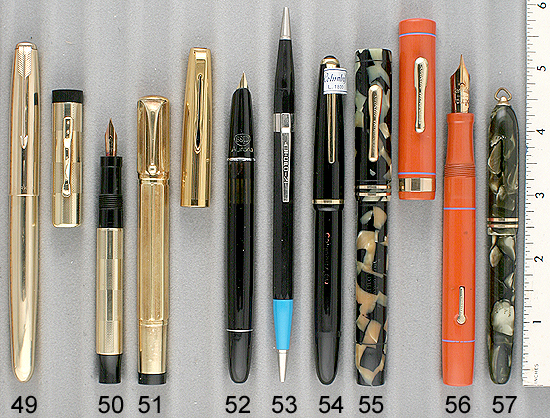 ntroduced in 1959, Sheaffer’s intent was to market their successful snorkel fill pens in a larger size and with their newly patented inlaid nib. 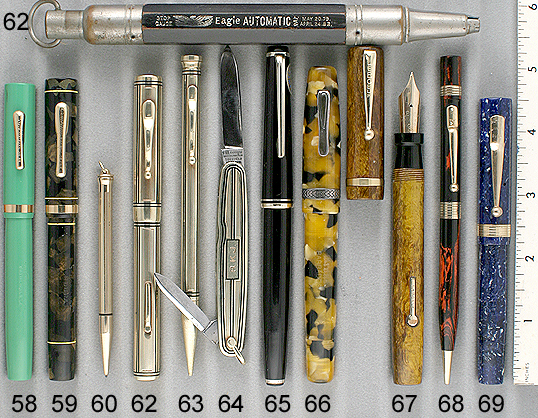 Because of their large size they were intended for men, thus the name “Pen For Men.” At this time the fountain pen industry was competing with ball pens, thus most PFMs have very stiff nibs so carbon copies could be made. 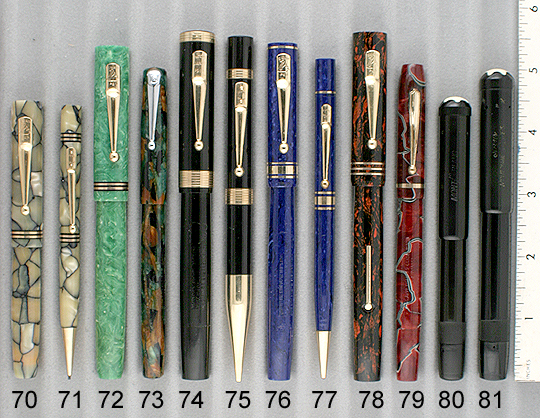 The day of the “expressive nib” was gone, at least for many years to come. I’ve seen PFMs which were manufactured in the USA, Canada, Australia and Argentina. They are an excellent quality pen, highly desired by users and collectors throughout the world. PFM models are listed below. A PFM VIII was recently found and sold to a collector/dealer for over $5,000. 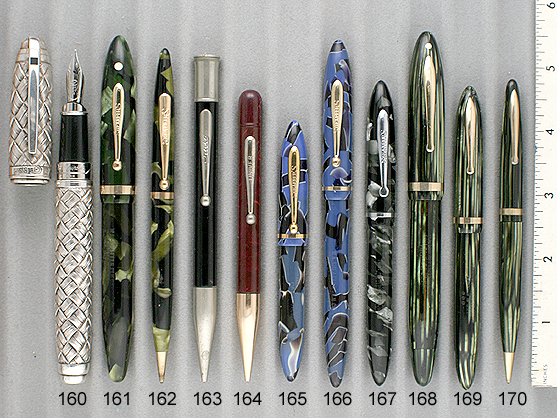 It was on display at the 2003 Columbus Pen Show. PFM I: Plastic cap and barrel, chrome trim, Pd-Ag nib. PFM II: Brushed steel cap, plastic barrel, Pd-Ag nib. 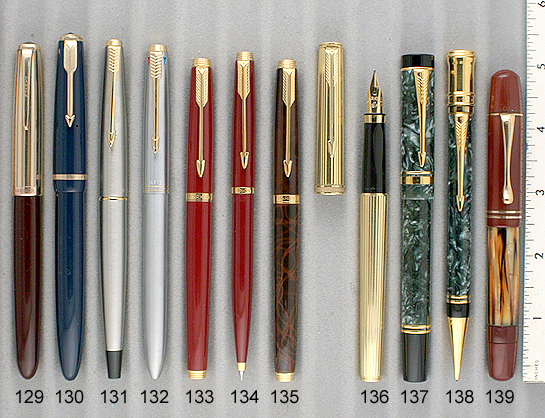 PFM III: Plastic cap and barrel, gold filled trim, 14 KT nib. 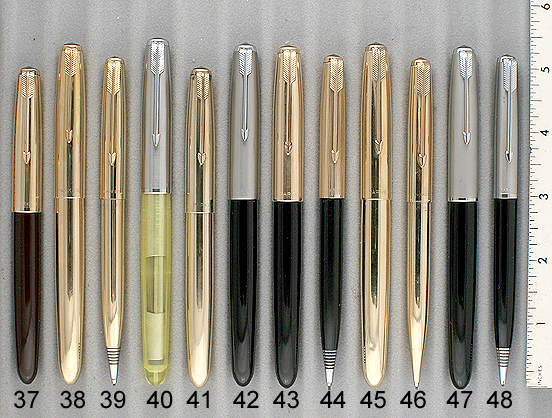 PFM IV: Polished Steel cap, gold filled trim, plastic barrel, GFT, 14 KT nib. 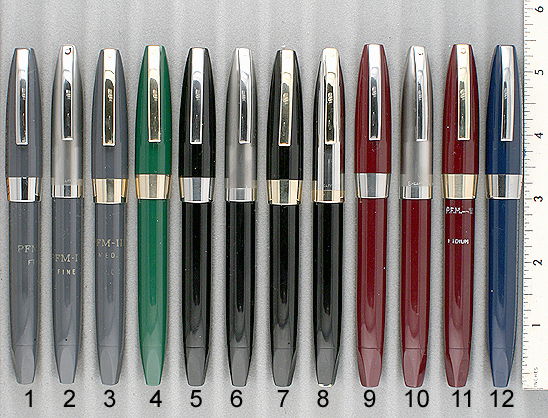 PFM V: Gold filled cap, plastic barrel, 14 KT nib. PFM VI: Gold filled cap and barrel, 14 KT nib. PFM VII: 14 KT cap, plastic barrel, 14 KT nib. 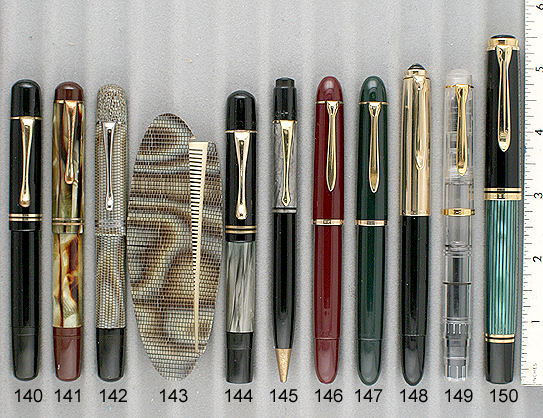 PFM VIII: 14 KT cap, barrel and nib – the “Masterpiece”. 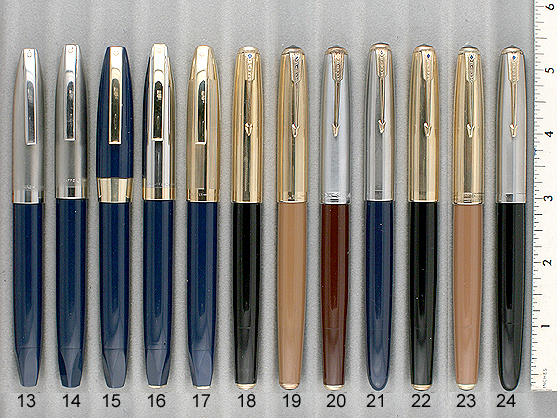 PFM “Autograph”, which has a plastic cap and barrel, 14 KT trim and nib. 1959 Sheaffer PFM I in Grey (rarest color). Chrome-plated trim. New-old-stock. Mint with original chalk label. This is the first PFM I in Grey I have ever had! Fine point. 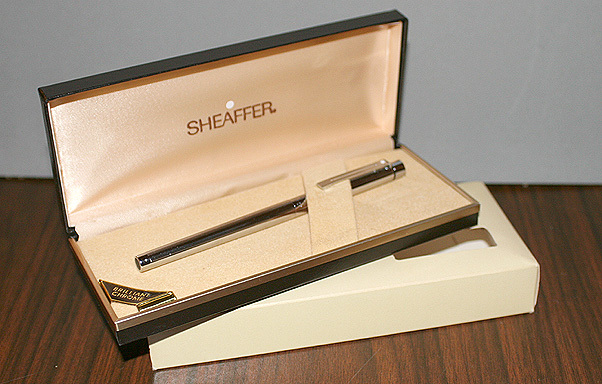 1959 Sheaffer PFM II in Grey (rarest color). Brushed Chrome cap. New-old-stock. Mint with original chalk label. Fine point. 1959 Sheaffer PFM III in Grey (rarest color). Gold-filled trim. New-old-stock. Mint with original chalk label. Medium nib. 1941 Parker 51 Vacumatic-fill in Black. First-year model with aluminum jewels. Gold-filled cap with alternating pinstripe and wave chased lines. Medium-fine nib. Near mint. 1946 Parker 51 Vacumatic-fill in Black. Brushed Lustraloy (stainless steel) cap with Gold-filled “Blue Diamond” clip. Medium nib. Near mint. 1945 Parker 51 Pencil in Black. 1946 Parker 51 Pencil in Black. 1/10 16K Gold-filled Pinstriped cap. Mint with original label. 1947 Parker 51 Pencil in Cordovan Brown. 1948 Parker 51 Aerometric-fill Demi in Cordovan Brown with Demonstrator Transparent Shell! 1/10 12 KT Gold-filled cap in 5 converging line pattern. 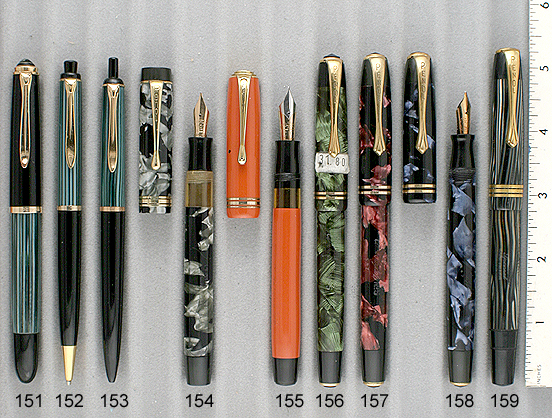 1950 Parker 51 Aerometric-fill Signet Demi. Much rarer than the fill-size set! No dents or dings. Medium-fine nib. Near mint. 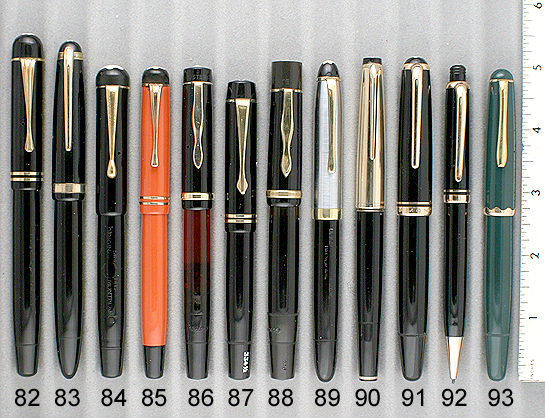 1951 Parker 51 Aerometric-fill in Black. 1/10 12 KT Gold-filled cap with 5 converging lines. Medium nib. A few minor surface scratches to the cap, otherwise near mint. 1951 Parker 51 Repeater Pencil in Black. 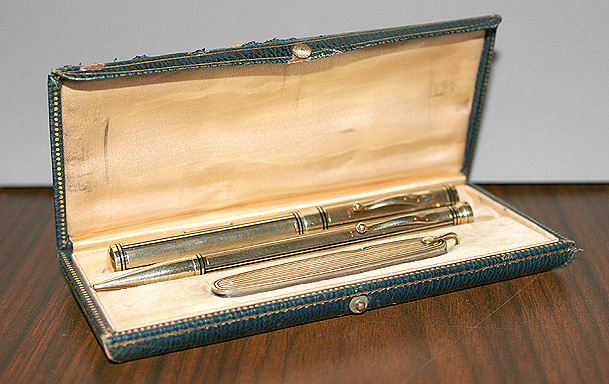 1951 Parker 51 “Presidential” Set in 14K Gold. Aerometric-fill. Medium nib. Mint in box. 1952 Parker 51 Repeater Pencil in Black. 1936 Columbus 55 PIF in Black. GFT. Black. Fine, flexible “Columbus 585” nib. 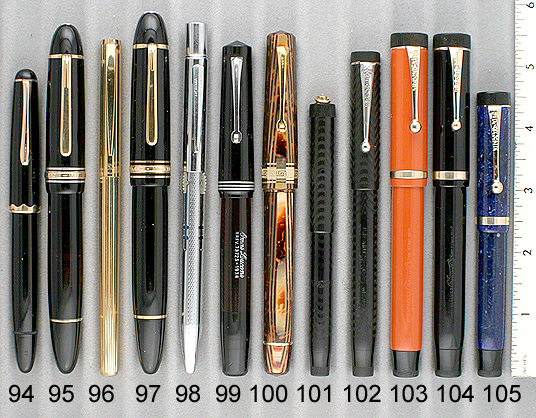 Streamlined Sheaffer look-a-like. New-old-stock. Mint in original box with original label. Close-up photo. 1927 Conklin Extra-long Sr. Endura in Cardinal Hard Rubber. Has the extra long cap and extra long section. Very rare! GFT. Set off with inlaid blue bands. Medium-fine nib. A surface scratch here and there in the rubber, otherwise near mint. 1920 Cross Mini-Pencil ring-top in 1/30 10K Gold-filled. Alternating pinstripe and plain panels. Nicely imprinted “Rose.” New-old-stock, mint in original box..
1900 Eagle “Automatic” Pencil utilizing the very early pushbutton spring lock clutch. Patent dates on pencil are from 1879 and 1883. Some brassing of the nickel plate, but the pencil still works perfectly. Uses very large lead. 1920 Edward Todd #3 LF 3-Piece Set (including a knife!) in solid 14K Gold. Incredibly beautiful, with pinstriped design surrounded by inlaid black enamel bands. Medium, extra-flexible nib. Each indicia engraved, “R.K.J.” Near mint+ in velvet lined gilt-tooled leather box (a bit of wear). Close-up photo. 1920 Edward Todd Knife for above set. 1961 Kaweco (Germany) Model V37 PIF in Black. GFT. Visualated barrel and hooded nib, reflecting German pen styles at the time. Fine point Mint, new-old, stock with original label. 1927 Mabie Todd Swan 46 Eternal LF in Jade (perfect color!). The Swan Eternal was Mabie Todd’s top-of-the line, lifetime guaranteed model. GFT. The two GF cap band are set off nicely with black plastic. Medium-fine nib. A tad of imprint wear (mostly readable), otherwise near mint. 1927 Mabie Todd Swan 46 Eternal LF Set in Black Hard Rubber. GFT. The Swan Eternal was Mabie Todd’s top-of-the line, lifetime guaranteed model. Fine point. New-old-stock. Mint in original box (dipped). Close-up photo. 1927 Mabie Todd Pencil for above set. 1927 Mabie Todd 242/52 (#2 Size) LF Set in Lapis. Strikingly beautiful set! GFT. Fine, triple-flexible, calligraphy nib! New-old-stock. Mint in original box (box a bit threadbare). Close-up photo. 1929 Mabie Todd Swallow #2 size LF in Mahogany with white & blue veins (strikingly beautiful). GFT. Broad, flexible nib. A tad of clip ball brassing, otherwise near mint. 1947 Montblanc 136 PIF in Black. GFT. Short visualated window, still with the original black vertical lines. Fine, triple-flexible calligraphy nib! Near mint. 1950 Montblanc 444 PIF in Black with Brushed Chrome Silvexa (stainless steel) cap and GFT. Medium nib. Near mint+ in original red leather pouch. Close-up photo. 1955 Montblanc 72 PIF in Black. Gold-filled cap with alternating pinstripe and plain panels. Fine nib, with a tad of flex for cushioning. A minor surface scratch here and there, otherwise near mint. 1956 Montblanc 256 PIF Set in Black. Montblanc’s largest pen in this series. Medium, flexible nib. Near mint++ in original zipper pouch with instructions & guarantee. Close-up photo. 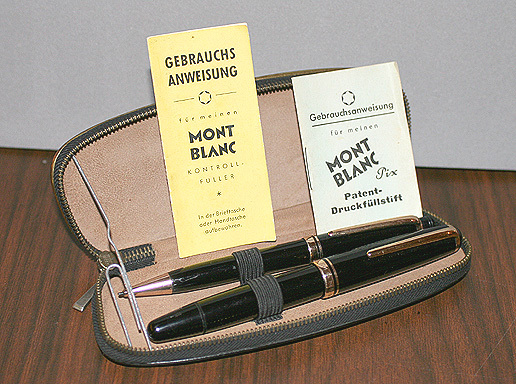 1956 Montblanc 274 repeater pencil for above set. 2000 Montblanc 149 PIF in Black. GFT. Lightly used, but still near mint condition. Medium nib. Lists over $600. 1945 Norma 4-Color Pencil in Polished Chrome. Bottom half has engine-turned design. New-old-stock. Mint in original hinged leather box. Inside of box factory imprinted “The Norma Pencil.” Close-up photo. 2005 Omas Large Pen in Arco PIF from Omas’s Celluloid Collection. Beautiful, Art-Deco faceted pen with 18K nib. Medium, flexible nib. Mint, new-old-stock. List is $950. 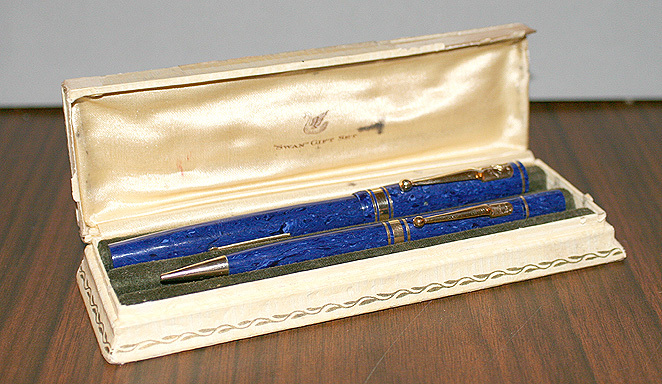 1927 Parker Duofold Jr. BF in Lapis. GFT. Medium, triple-flexible nib! Barrel a tad darker than the cap, but this is made up for with the incredible nib. Otherwise near mint. 1928 Parker Duofold Sr. “Big Red” BF in Cardinal. GFT. Medium nib. New-old-stock. Mint. 1932 Parker Thrift Time BF in Ivory with Red Veins. GFT. Medium, flexible nib (flexible Parker nibs are rare). Barrel a tad darker than the cap, otherwise near mint. 1935 Parker Deluxe Challenger BF in Green Marble. GFT. Broad point. Imprint just a little worn (still fully readable), otherwise near mint. 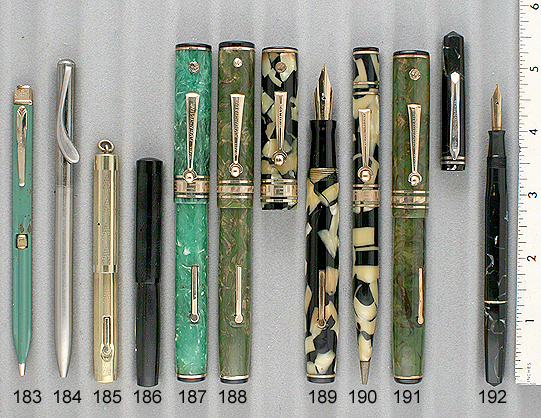 1937 Parker Vacumatic Major in Green Laminated. GFT. Two-tone medium-fine nib. Double jeweled. Near mint. 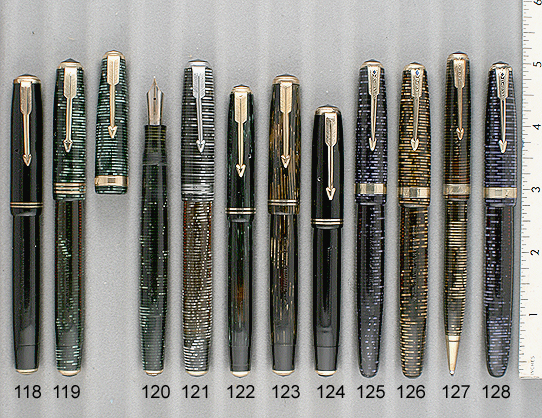 1938 Parker Vacumatic Standard in Silver Laminated. CPT. Medium, with a bit of flex for cushioning (Vac nibs with flex are rare). Double jeweled. No date code, otherwise near mint. 1938 Parker Vacumatic Juniorette in Green Shadow-wave. 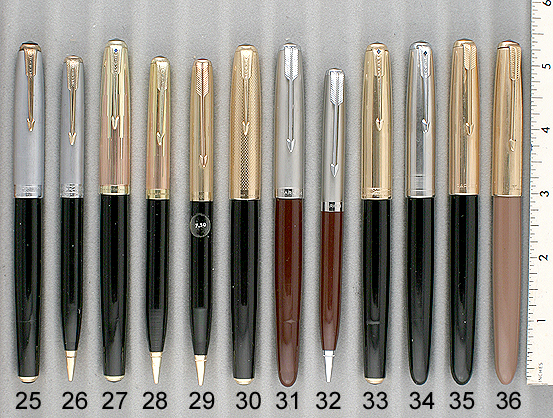 The Juniorette model is thinner and shorter than the Junior, and was previously called the Slender Jr. Vacumatic. GFT. Double jeweled. Just the slightest imprint wear by the “Made in USA,” otherwise near mint. 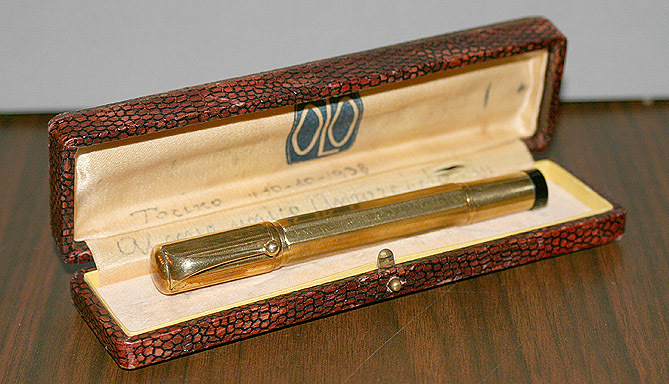 1938 Parker Vacumatic Jr. in Golden Shadow-wave (rare model). GFT. Nice barrel translucency. Fine point, with an italic flair. Double jeweled. A minor surface scratch here and there, otherwise near mint. 1950? Parker Duofold (?) Aerometric-fill in Burgundy. Rolled-gold cap with alternating pinstripe and plain panels. 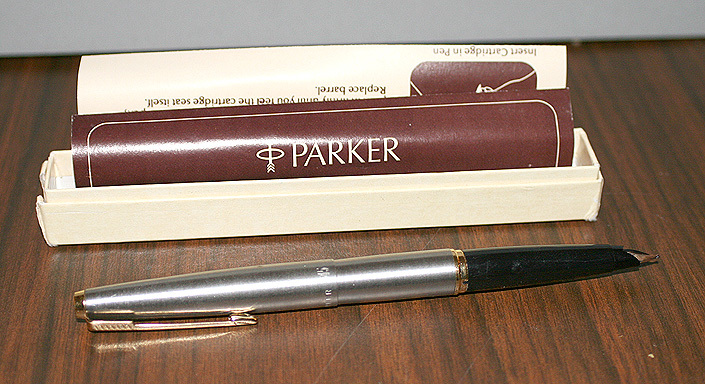 Odd pen, with no markings on the barrel, a signed “Parker” thin non-arrow clip, and cap signed both “Parker” & “Rolled Gold,” with a grey jewel. Likely made in Denmark. All other late Duofolds I have seen have matching screw-on caps which screw on. This cap is metal and slips on, fitted with a clutch just like a Parker 51. Perhaps a prototype(?). Medium-fine, flexible nib. Near mint. 1960 Parker 45 Flighter cartridge/converter fill in Brushed Lustraloy (stainless steel). Converter included. Rarer version with 14K nib (medium). Comes with original box and instructions. Close-up photo. Medium nib. Cap and barrel are near mint+. Pen has been filled. 1975 Parker 75 Roller Ball – Pencil Set in Burgundy Lacque (rare color). GPT. New-old-stock. Mint. 1989 Parker 75 Premier in 18K Solid Gold. Very rare! Broad 18K nib. Broad point, with just enough flex to provide some cushioning. Lightly used, but in superb condition. Near mint. List at the time was over $4,000! 1992 Parker Ball pen for above set. 1942 Pelikan 200 AUCH-Pelikan Repeater Pencil in Grey Pearl. GFT. Near mint. 1957 Pelikan 400NN PIF in Green Striped with Black Cap. GFT. Extra-smooth, medium, flexible nib. Sports the famous “Click Cap” which has a build in catch against unscrewing accidentally in your pocket. Near mint+. 1946 Penol Ambassador No. 5 447 BF in Green Pearl Mesh (Web). GFT. Black blind-cap matches black portion at top of pen cap. Bottom tassie & jewel. Same material as ’40s UK Duofold. Medium-broad nib. New-old-stock. Mint with original price label. 1946 Penol Ambassador No. 5 647 BF in Red Marble. GFT. Black blind-cap matches black portion at top of pen cap. Bottom tassie & jewel. Medium, extra-flexible, italic nib. Near mint. 1946 Penol Ambassador No. 5 647 BF in Blue Marble (rare color). GFT. Black blind-cap matches black portion at top of pen cap. Bottom tassie & jewel. Medium, flexible nib. Near mint. 1952 Penol Ambassador Special 845 BF in Silver & Black Veined. 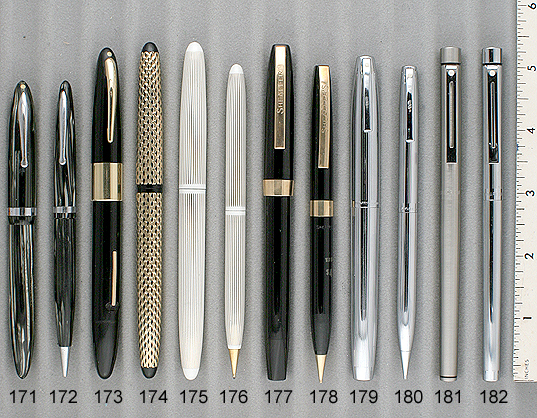 The “Ambassador Special” replaced the “de Luxe” series as Penol’s top-of-the-line pen. Black blind-cap matches black portion at top of pen cap. Visualated barrel. Bottom tassie & jewel. Medium, extra-flexible nib. Near mint. 2005 S.T. Dupont Pallarols “Basketweave” cartridge/converter fill in 950 Silver. In 1750, Vicente Pallarols opened his silver workshop in Barcelona, Spain. 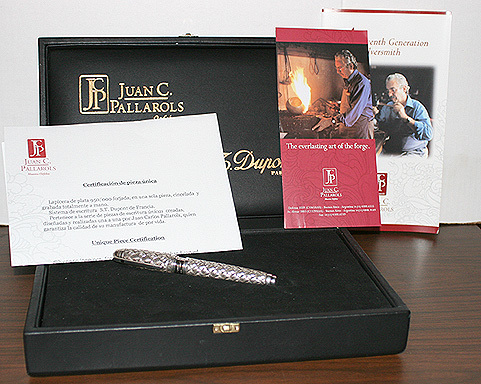 Today, Juan C. Pallarols and his son, the 7th Generation, have added fountain pens to their collection of exquisite hand made pieces of art. 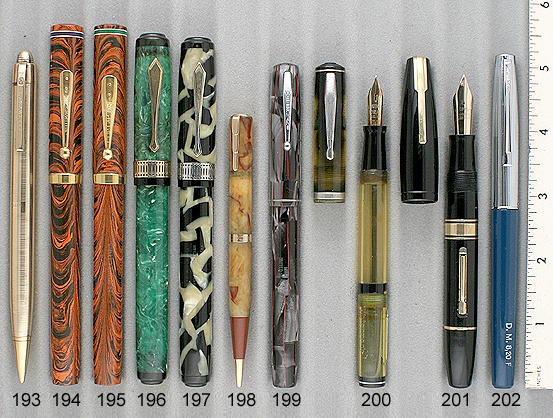 There was a spectacular display of their fine works at the 2005 NYC Pen Show. A very Limited Edition, mint in it’s original form fitted box with all papers, it comes with a “Unique Piece Certification” signed by Juan Pallarols himself. Close-up photo. Medium nib. Mint (dipped). List price $6,000. 1933 Sheaffer 3-25 Balance LF in Blue and Black with White Veins. GFT. The shorter, even rarer version. Perhaps Sheaffer’s most striking plastic! Fine point. A tad of clip ball brassing, otherwise near mint. 1933 Sheaffer 3-25 Balance LF in Blue and Black with White Veins. GFT. Perhaps Sheaffer’s most striking plastic! Fine point. A tad of clip ball brassing, otherwise near mint. 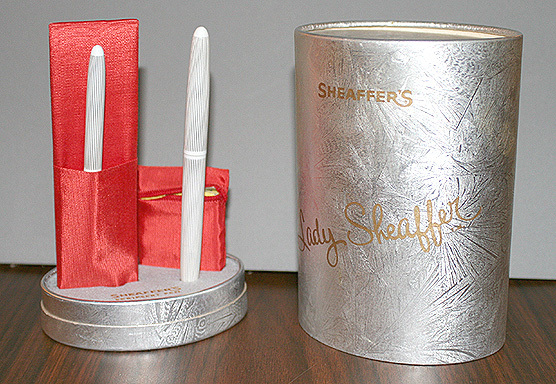 1958 Sheaffer Lady Sheaffer Skripsert Set in White with Gold Plate Pinstriping. Medium, flexible, “upturned” nib. Near mint in wonderful original cylinder shaped packaging. Close-up photo. Comes with Pocketbook pouch and marching holder for cartridges. 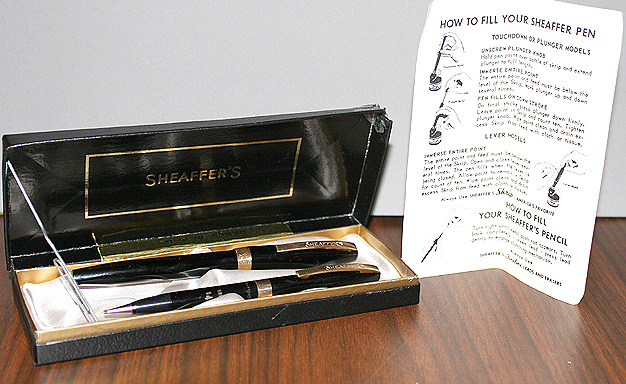 1958 Sheaffer Pencil for above set. 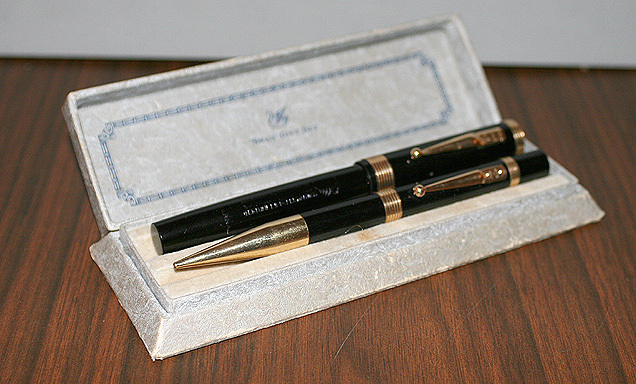 1960 Sheaffer Target Touchdown Set in Black. Rare, short lived model, introduced just after the PFM and before the Imperial. GFT. Sports a shorter, wrap-a-round Triumph nib. Fine point. New-old-stock. Mint in original box (a bit threadbare) with instructions. Close-up photo. 1960 Sheaffer Pencil for above set. 1974 Sheaffer Lifetime Imperial Cartridge-fill Set in Polished Chrome. Alternating pinstripe and plain panels. Relatively rare, later model. Inlaid nib with medium point. New-old-stock. Mint in original box with cartridges and instructions. Close-up photo. 1974 Sheaffer Pencil for above set. 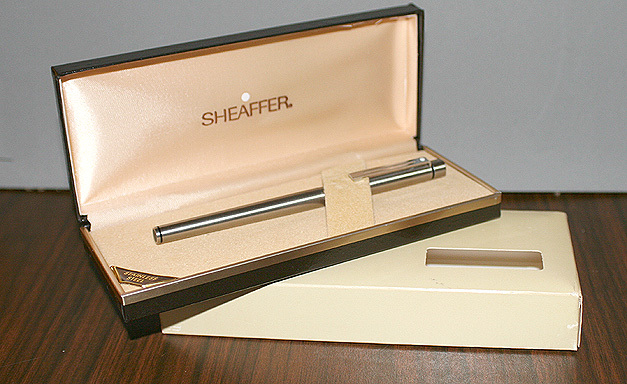 1989 Sheaffer Slim Targa cartridge/converter fill in Stainless Steel. Discontinued model. Converter included. Medium nib. Mint. New-old-stock in original box with papers. Close-up photo. 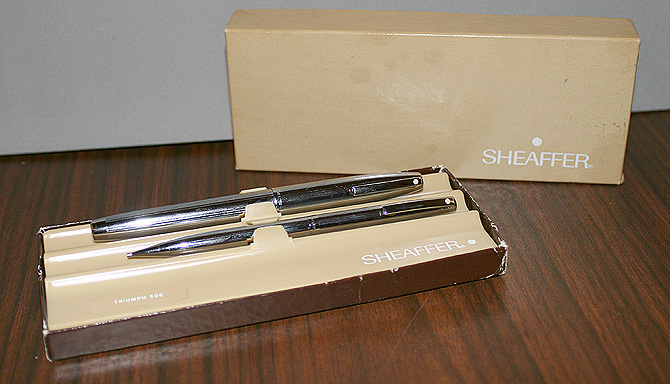 1989 Sheaffer Slim Targa cartridge/converter fill in “Brilliant Chrome.” Discontinued model. Converter included. Medium nib. Mint. New-old-stock in original box with papers. Close-up photo. 1929 Wahl Eversharp Oversize Deco Band Gold Seal LF in Black & Pearl. GFT. Typical light ambering of cap and barrel, but this is more than made up for with it’s incredible fine, triple-flexible Calligraphy nib! Clip ball brassing, otherwise near mint. 1929 W’Eversharp Oversize Deco Band Pencil in Black & Pearl. Near mint. 1929 Wahl Eversharp Oversize Deco Band Gold Seal LF in Green & Bronze. GFT. Fine, triple-flexible, calligraphy nib! Pinpoint brassing of the upper corners of the clip and the clip ball, otherwise pristine condition. 1929 Waterman Patrician LF in Nacre (Black & Pearl). GFT. 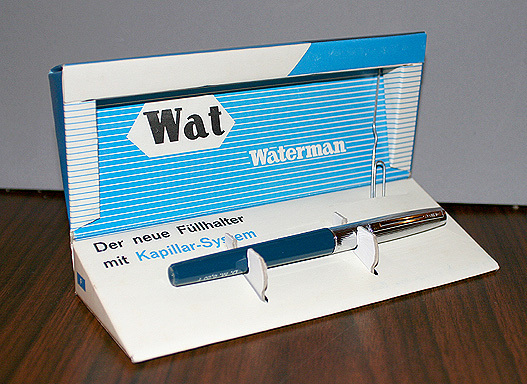 Waterman’s first entry into plastic pens, and has become one of the most sought after pens by collectors today. Normally found heavily ambered, this example is mint! Fine nib, with just a tad of flex. 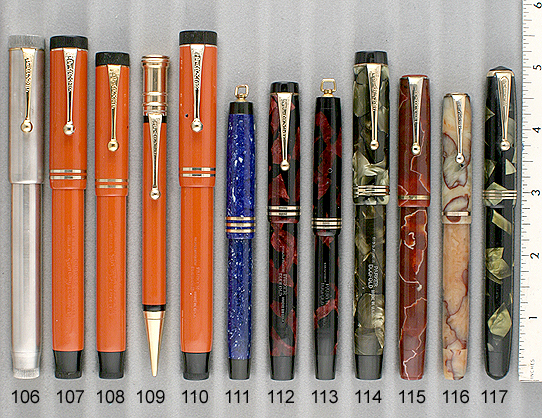 1929 Waterman Lady Patricia Pencil in Onyx (red cream). GFT. Excellent color! Near mint. 1958 Waterman “X” Pen Capillary-fill in Blue. No moving parts — fills by drawing the ink up into a wick! Chrome plated cap. Mint, with original chalk marks, in box for German market. Close-up photo.